Promag measuring devices offer you cost-effective flow measurement with a high degree of accuracy for a wide range of process conditions. Endress Hauser works to a defined standard production time (from order entry to goods issue) depending on the variant of the Promag 50W. 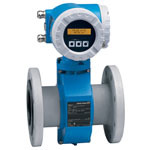 Endress Hauser will ship your order direct to your delivery address. In certain cases express or emergency shipments can be made on request. Check your order status online using your reference number or the Endress Hauser order confirmation number.